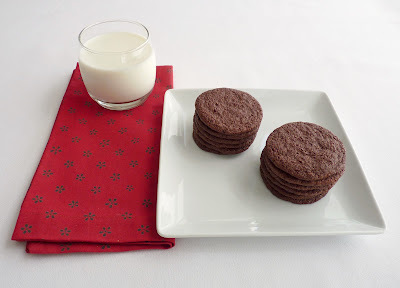 Fair warning: This may be the last time you buy chocolate wafer cookies. Alice Medrich has a recipe that is so easy and so delicious, you really won't be able to spend money on packaged cookies again without feeling a tinge of doubt and/or regret. These cocoa wafers live up to their reputation. They're thin, super crisp and full of a deep dark cocoa sensation that captures your approval at your very first bite. Not too sweet, not too buttery, not too rich, they're ready in no time flat. And really, it doesn't get any easier. The cookie dough is made in a food processor with basic ingredients and then formed into logs. Once the logs have thoroughly chilled for a couple of hours - the wait is the hardest part - you just slice up the cookies, plop them on a lined baking sheet and in 12 minutes, you're in the zone. Go ahead. Pour a steaming hot cup of good strong coffee or an ice cold glass of milk and congratulate yourself. 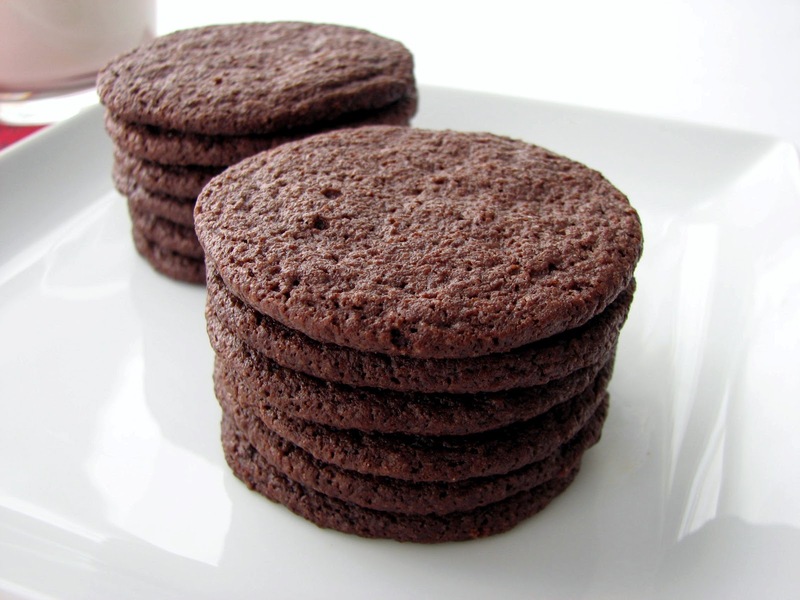 You've just had the perfect chocolate wafer. - I made these with undutched (natural) cocoa powder. I haven't tried them with dutched. - If you're short on time, place the logs of cookie dough in the freezer for an hour. - I baked mine exactly 12 minutes. The cookies crisp up as they cool. If they don't, you didn't bake them long enough. Just put them back in the oven for a couple of minutes and then let them cool. 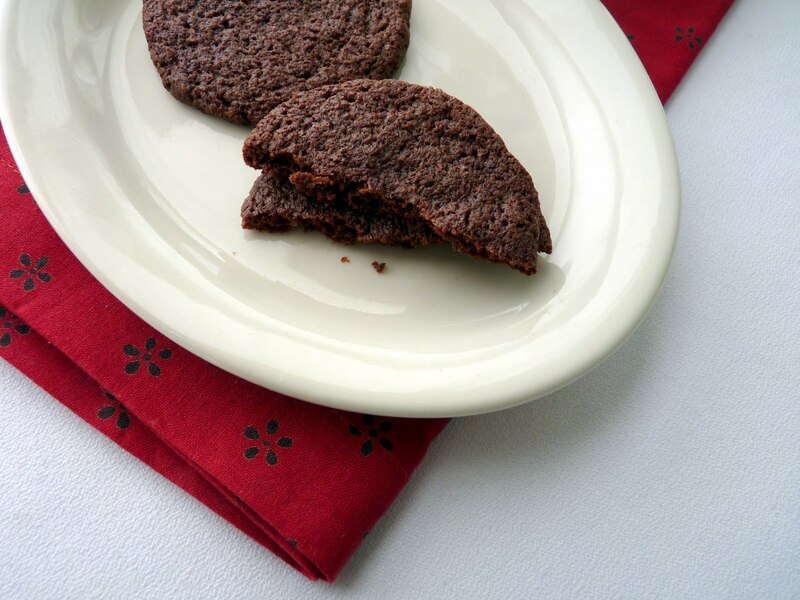 - Cookies will store airtight for up to 2 weeks or frozen up to 2 months. - This is a great cookie for small ice cream sandwiches, icebox cakes or crushed to make a cookie crust for cheesecake or cream pies. Place the flour, cocoa powder, sugar, salt and baking soda in the bowl of a food processor and process until thoroughly mixed. Cut the butter into small pieces and add them to the bowl. Process for about 10 - 15 seconds. Combine the milk and vanilla. With the processor running, add the liquid and pulse until the mixture clumps around the blade or at the sides of the bowl. The dough will be very soft. Transfer the dough to a piece of parchment and form a log about 14" long and 1 3/4" in diameter. Roll the log up in the parchment, wrap in plastic and chill until firm, 1 - 2 hours. Cut the cookie dough into scant 1/4" slices and place them 1 " apart on the lined baking sheets. Bake 12 - 15 minutes. Cool completely on baking sheets set on a wire rack. We've approached that time of year to celebrate a new crop of beautiful juicy peaches. 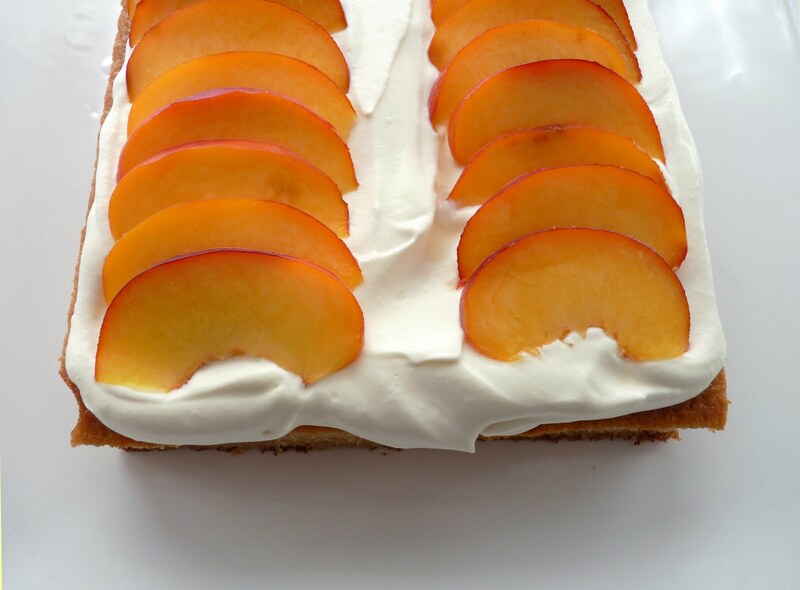 It's the season for shortcakes, peaches with sabayon, peach cream puffs and peaches simply roasted and served with ice cream. This time around, I've put them together with the irresistible winning combo of cake and whipped cream. 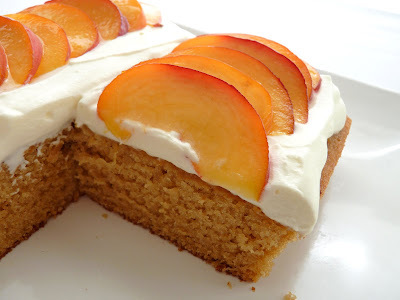 The cake's flavor is provided by a higher ratio of brown sugar, which brings out a nice caramel quality that pairs well with peaches. It's a plain cake with a fairly dense soft crumb. I bake it in a thin layer to keep the proportions of fruit and cream in the game. As much as I love all the stone fruits of the season and seeing the markets alive with the sensation of vivid color, for me, fresh peaches are the grand signal that summer has indeed arrived. Enjoy them while they last! 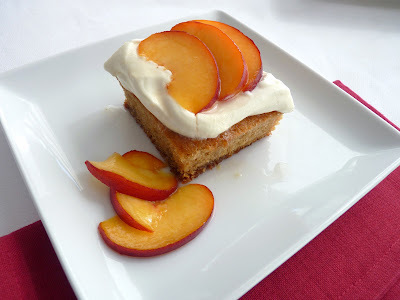 - Let peaches ripen at room temperature. You should be able to smell their fragrance. - Having the butter, egg and milk at room temperature means the cake batter will emulsify properly and produce the right structure and texture. The egg in shell can be placed in a bowl of hot water to hasten the process. - As an alternative to the honey syrup used for the peach slices, simply toss them in 3 - 4 tablespoons of brown sugar and a spritz of lemon and set aside to macerate. Add a pinch of cinnamon for a bite of spice. - Add a couple of teaspoons of rum or brandy to the whipped cream for some variation. - Enjoy this dessert with a glass of Viognier, a white wine with crisp citrus overtones and a slight hint of honey. - More simple pleasures of summer: Rhubarb Compote with Strawberries & Cream, Cherry Crisp with Buttermilk Ice Cream or Plum Handkerchiefs. - One of the requests I often get is for information about the tools I consider essential for baking. Very high at the top of my list is parchment paper. A box of 1000 super large sheets is one of the first things I bought when I finished pastry school! I use it to roll out doughs, wrap cookie dough logs and roulades, line pans and baking sheets (I also use silpats). Preheat oven to 350 degrees. Lightly grease an 8" square pan. Line with parchment paper, leaving an overhang of a couple of inches on two sides. Sift together flour, baking powder, baking soda, salt, cinnamon and nutmeg. Cream the butter, brown sugar and granulated sugar until lightened, about 3 minutes. Scrape down the bowl, add the egg and mix until completely blended. Combine the milk and vanilla. Alternately add a third of the flour mixture and half the milk, beginning and ending with flour. Beat until it's just about completely blended. Finish the mixing by hand using a rubber spatula, scraping the bottom of the bowl. Pour the cake batter into the prepared pan and spread it out evenly. Bake for 23 - 25 minutes or until a tester comes out clean. Cool cake in pan on a wire rack for 10 minutes. Run a knife around the edges and gently lift out of the pan using the parchment to assist. Cool completely. Place the honey, water and lemon juice in a saucepan and bring to a simmer to dissolve. Take off the heat and set aside to cool. Wash the peaches and cut into thin slices. Toss with the honey syrup to coat. Whip the heavy cream with sugar and vanilla to a very soft peak. To assemble, gently peel the parchment off the cake and place on a serving platter. Dollop the whipped cream on top and spread evenly. Garnish with peach slices. 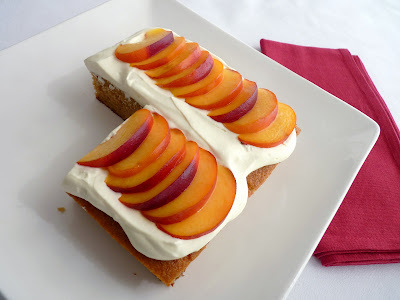 Serve cake slices with any extra peaches and cream. 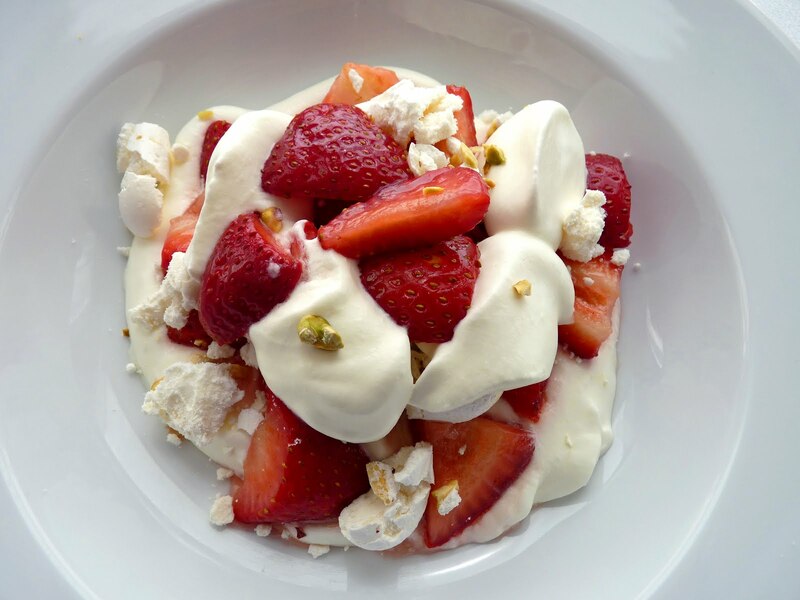 When I first heard about a dessert named Eton Mess, my interest was certainly piqued. What's the Eton and what's the Mess? As it turns out, it actually translates into something incredibly simple. The dessert is a tumble of fresh strawberries, fresh whipped cream and crumbled meringue. And apparently it's something that's served in the dining hall at Eton, the centuries old English boy's boarding school and producer of prime ministers. The textures and flavors are all in balanced proportions. The shatter of crispy sweet meringue, the tart acidity of the strawberries and the soft clouds of whipped cream are a wonderful swirl of enjoyment on the palate. So while it may seem like a messy arrangement, I say go ahead and take a basket of strawberries that are in abundance now, create this English trifecta and enjoy the simple pleasures of summer. - Egg whites will whip with greater volume if they are at room temperature. To start, whip the whites with a pinch of salt until they are foamy and opaque. For a stable meringue, slowly add the sugar a little bit at a time and then keep whipping until they are glossy and form a stiff peak without slumping over. If the meringue starts to look dry and grainy and begins to separate, you've gone too far. - If you dollop the meringue instead of piping, use a spoon to spread it out to about a 1/2" thickness. - The meringues can be made a couple of days ahead and stored in an airtight container layered with parchment or wax paper. 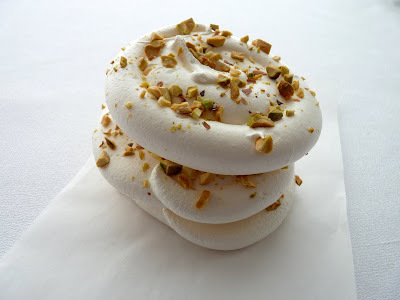 In humid climates, meringues should be used the same day. - Assemble the dessert right before serving to preserve the crispness of the meringue. For presentation on a table, rather than plating, assemble in layers in a glass serving bowl. - Raspberries or apricots or any tart fruit would also make a nice Eton Mess. For the meringue, preheat oven to 200 degrees. Line a baking sheet with parchment or a silpat. Whip egg whites with a pinch of salt until foamy and opaque. Slowly add sugar and continue whipping until the meringue holds stiff, glossy peaks. Pipe or dollop 3" discs of meringue onto prepared baking sheet. Press the pistachios onto the surface. Bake the meringues until crisp and dry, about 2 hours. Turn off the oven and let the meringues continue to dry in the oven for another 1/2 hour, then remove to a wire rack and cool completely. 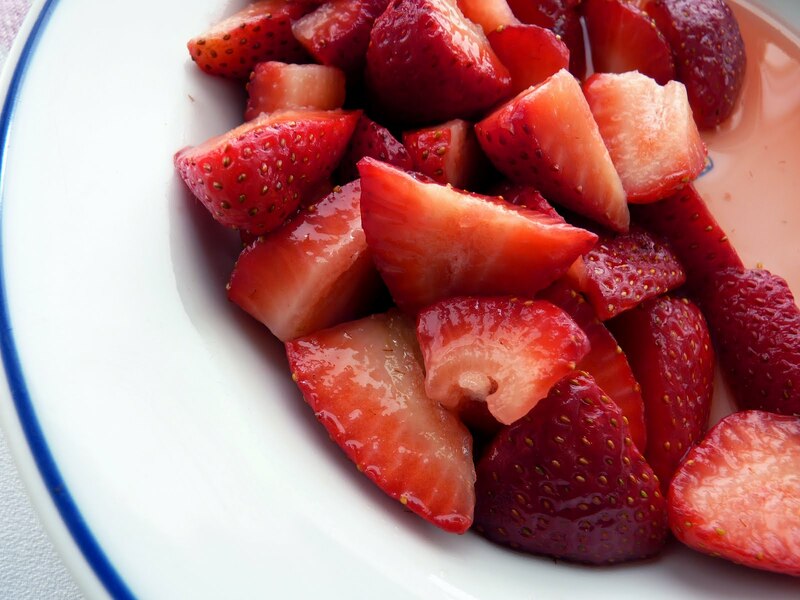 Hull and slice the strawberries and toss with sugar, to taste. Let them macerate for about 20 minutes, stirring occasionally to distribute the juices. Whip the heavy cream with sugar and vanilla until soft peaks form. To serve, dollop each plate with a thin layer of whipped cream and then distribute the berries. Garnish with a few more dollops of whipped cream. Break the discs of meringue into bite-sized pieces and garnish each plate. Serve immediately. I'm definitely one of those people who seem to have a hard time passing up a beautiful basket of fresh berries whenever they catch my eye. There's something about their bright fresh flavor, tartness and beautiful color that tempts me every time. 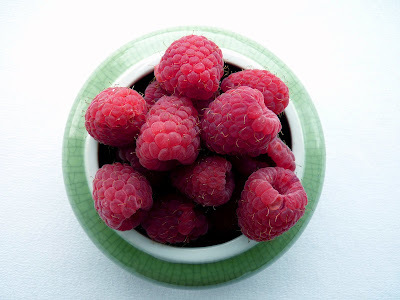 And today's bundle of raspberries landed on my table with the best of intentions. 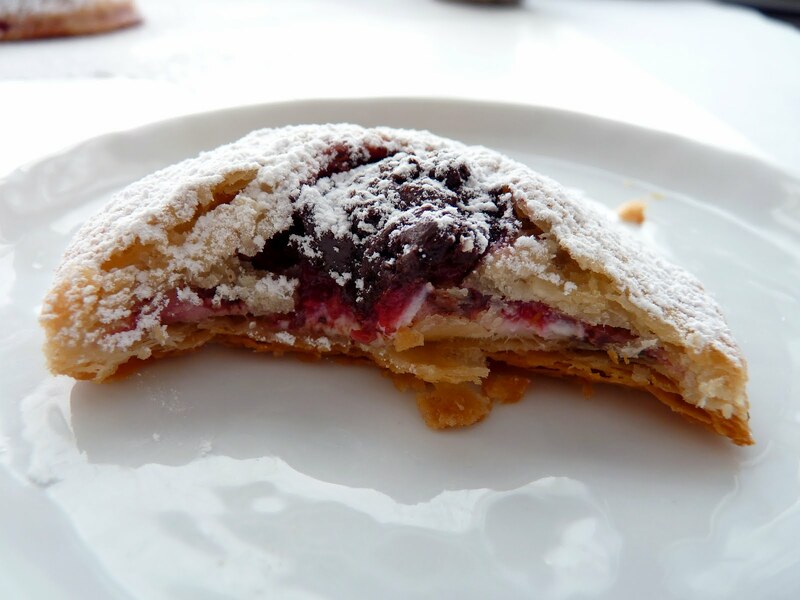 This recipe combines raspberries with some sweetened cream cheese and a sprinkle of finely chopped chocolate all tucked into some buttery, flaky pastry. The dough is mixed quickly in a food processor and chilled. The fillings are simple and take about a minute each to prepare. After a pop into the oven for about 15 minutes, they're ready and fresh for tasting. These little pastries would make a satisfying afternoon snack or a nice additional sweet on your brunch table. All the elements are there - tart, creamy and crunchy all in one bite. - For the dough, make sure the butter and water are very cold. Pulse the mixture in the food processor to avoid overmixing. Let the dough rest in your refrigerator for at least 2 hours. 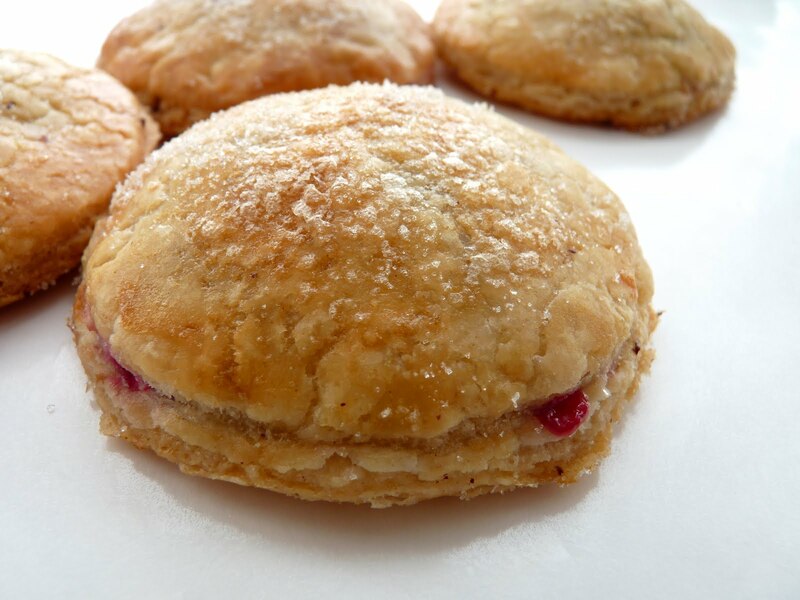 - Taste both the cream cheese and the raspberry fillings to test for sweetness. - If raspberries aren't in season where you are, replace with your favorite jam. - Finely chop the chocolate so it melts evenly. - I used a truffle scoop to portion the fillings on the pastry dough. - For something different, replace the cream cheese with some tangy goat cheese. For the pastry dough, place the flour, sugar and salt in the bowl of a food processor. Pulse to combine. Add the small pieces of butter and pulse until you can still see chunks about the size of small peas. Add the cold water. Pulse the dough until it just begins to form clumps around the center of the bowl, taking care not to overmix. Gather the dough and place half of it on a sheet of plastic wrap. Form a disc, wrap tightly and refrigerate for at least two hours. Repeat with the second half of the dough. For the fillings, combine the cream cheese with the sugar and vanilla. Chill. Smash the raspberries with a fork just enough to break them up. Sprinkle with sugar and stir. Set aside. When you're ready to roll out the dough, preheat the oven to 375 degrees. Combine egg and water for egg wash and set aside. Remove one packet of dough from the refrigerator and rest on a lightly floured work surface or piece of parchment paper for a few minutes so it can warm up a bit to prevent cracking. Then roll out the dough to about a 12 1/2" x 16 1/2" rectangle with a 1/8" thickness, gently lifting and moving the dough after each roll and keeping the work surface lightly floured as needed. When you have the desired dimensions, brush off any excess flour and place the dough on a baking sheet lined with parchment. Chill for a few minutes while you repeat with the second packet of dough. Cut out twelve 3" rounds from each sheet of dough and place twelve of them equally spaced on a baking sheet lined with parchment or a silpat. Remove cream cheese filling from the refrigerator and scoop about 1 1/4 - 1 1/2 teaspoons in the center of the twelve pastry rounds on the baking sheet. Spread it out a bit, leaving a border around the edge of the pastry. Top with an equal amount of raspberries and a sprinkle of finely chopped chocolate. Brush the border of each pastry with egg wash and top with remaining pastry rounds. Press down gently and seal the edges. Chill until the oven is ready. Brush each pastry with egg wash, including around the edges to secure the seal, and sprinkle lightly with granulated sugar. Bake the pastries for 15 - 18 minutes or until they are browned and puffed. Cool on a wire rack. 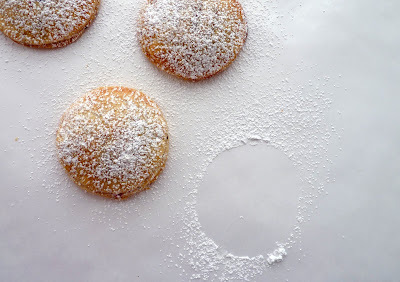 Dust with powdered sugar and serve.